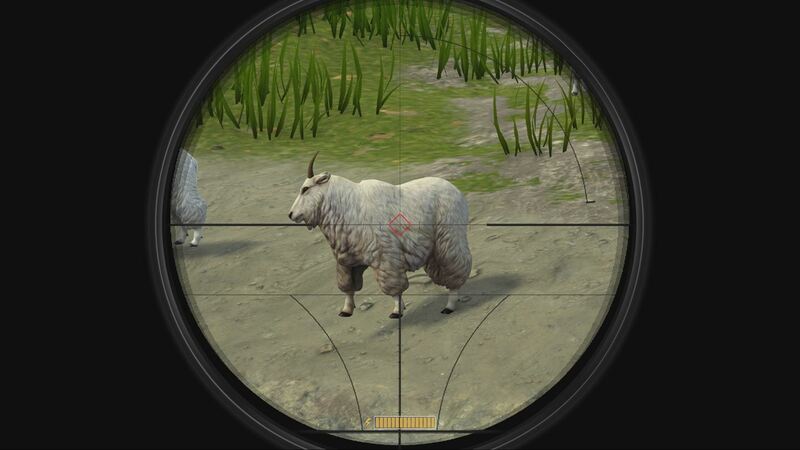 Welcome to Deer Hunter: Reloaded, a game that has you shooting more sheep than actual deer. In Deer Hunter: Reloaded, which for the sake of easy reading I will call ‘the game’, sees you playing as a nameless hunter who is being put through the ringer as a test to see if you are a master hunter. You must hunt in regions of Texas, Colorado, and Alaska, killing three trophy animals in each state, whilst trying to protect yourself from one predator in each. There are quite a few weapons that you can purchase, split into two categories. There are your hunting rifles, very simple long range weapons that don’t need much explaining, and then there are your shotguns, which are pretty useless if you’re not being accosted by a predator. You’ll find both pump and breach shotguns available, which simply describes the action in which to ready the gun for firing a shell. A pump shotgun is just a simple slide back of the pump at the front of the gun, which allows the next shell, pulled from the internal clip, to be knocked and ready in the barrel, whilst a breach shotgun is one that separates at the base of the barrel, near the grip, and needs to be manually loaded after both, or sometimes one, shell is expended. Why is that important to know? Well, I mentioned that predators can accost you, and I meant that in the sense that Mountain Lions, Wolves, and Kodiak Bears are all present, in their respective states, and have no issues with mauling your character. You won’t run into them at first, but these predators are going to pop up and come after you, and the best way to protect yourself against them is by using a shotgun. Thing is, the shotguns don’t have a noticeable spread, and you can get jumped by three wolves at once, which makes for an unfortunate time if you’re using a breach shotgun. The reload speed is slower, and so it is recommended to take a pump shotgun with you. That’s what I like about this game – that there is a purpose to taking a specific type of gun with you on your trip, rather than some hunting games in the past where just about any gun is suitable for each adventure. Now, keep in mind, that is really the only thing I like about this game – the fact that they cared to put some variety and reason into buying a different gun for your hunting trips. Granted, there are only nine hunting rifles and seven shotguns for you to purchase, so it’s kind of a tiny let down in the end. Deer Hunter could definitely have gone with more variety in the guns, but at least there are some there to begin with. On to the rest of the game. The first hunting area you spend time in is in Texas. You get little challenges on the left side of the screen that lead you into progression missions, that in turn will allow you to unlock more areas and give you further experience to level your hunter up. Each level will unlock a new weapon for you to purchase, so you can’t just nab the last rifle at the beginning of the game, which is fine by me. I never really did feel the need to replace my rifle though, because I had upgraded it and wanted to save up my hunting coins – for which I will refer to them as bucks – to see if the last rifle would be any better than the first. It’s safe to say that I didn’t make it to the end of all the levels though, for the game became a heavy slog of repetitive, gun range shooting. Now, many of you may have gotten the impression that by ‘gun range shooting’, you’ll be trapped in a gun range trying to get your accuracy up to scratch to be a decent hunter. Not quite. See, the game forces you to stay on the paths of the map, and won’t allow you to get closer to your targets than whatever the fallen tree dictates. Most of the time, if you do go off path, the animals will immediately run away from you, and you will be given a ten second timer to move back to the path. 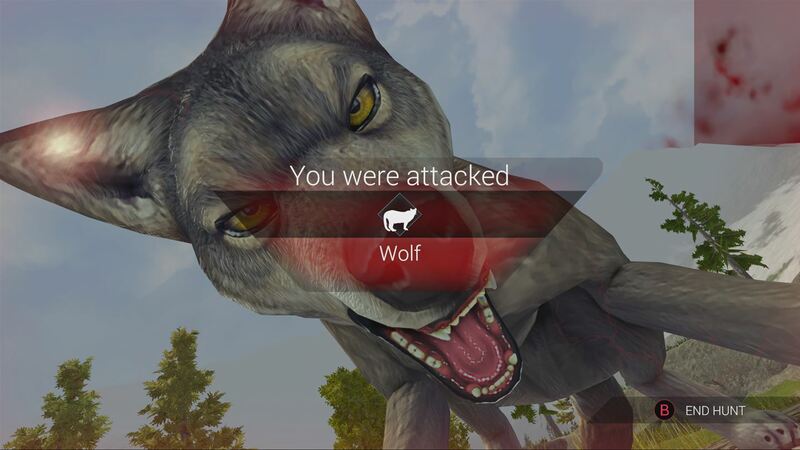 Walk out a few feet further, and the game will immediately bump you to the map screen so you can travel to another hunting ground of the region. Each of the hunting areas is pretty tiny, and when you factor in the fact that you can only get so close to your target animals, it really does feel like a firing range that includes moving targets. And these targets move in the funkiest of ways. I once shot a deer in the lungs, which is a vital shot that should kill it shortly after infliction, and it proceeded to run in a circle. By run in a circle, I don’t mean running around a pillar, I mean that it began to spin in place whilst using its running animation. On the next shot, that deer teleported into the ethereal and was never seen again. It was at that point that I realized I must be shooting tiny blackholes at my targets, or that this game is probably horribly buggy and the 5GB patch that I downloaded did nothing to fix it. There are also duck hunt inspired missions. By inspired, I mean direct copies of that old game, except you’re going to be using the internal shooting mechanics of this game, which left quite a bitter taste in my mouth. As I’ve already said my piece about the shooting, just imagine having to shoot tiny creatures out of the sky, but feeling like you’ve taken a tranquilizer right beforehand. The sluggish nature in which you move makes even something so nostalgic feel like a bitter barb in the side of your nostalgia bank. Throw in the fact that gaming has come such a long way from those original titles, and you just feel like you should ask for more. There’s nothing wrong with pulling inspiration from something, but there certainly is something wrong in directly copying it. If you value leaving your memories of duck hunting intact and unsullied, do make sure to not play that portion of this game. Honestly, Deer Hunter: Reloaded is broken in so many ways. There are graphical issues because the load distance of the game is so low that you can see black, forward-facing sprites of trees just flying in the air. Even when you zoom with the binoculars or scopes, the game doesn’t push the render distance outwards, so you can look at these horribly pixelated sprites up close and personal as they levitate on the horizon. I wish I could say that only happens once or twice, but you’ll constantly find these floating forest ranges in near every hunting ground outside of Texas. In Texas, the game is a little more egregious by showing you forward-facing sprites mixed in with three-dimensional trees. You’ll see cacti that follow you around the tiny map, always watching as they stand right next to a tree that is three-dimensional, albeit you can count the polygons on it. To put it plainly, this game doesn’t look good by any stretch of the imagination. The premise had me thinking Cabela’s Dangerous Hunts, but even the Cabela’s game from 2009 had some better texture work in it, especially when it came down to the trees. Skip to the 2013 installment of Cabela’s, and it has significantly better models for the animals that just look better than what this has to offer. 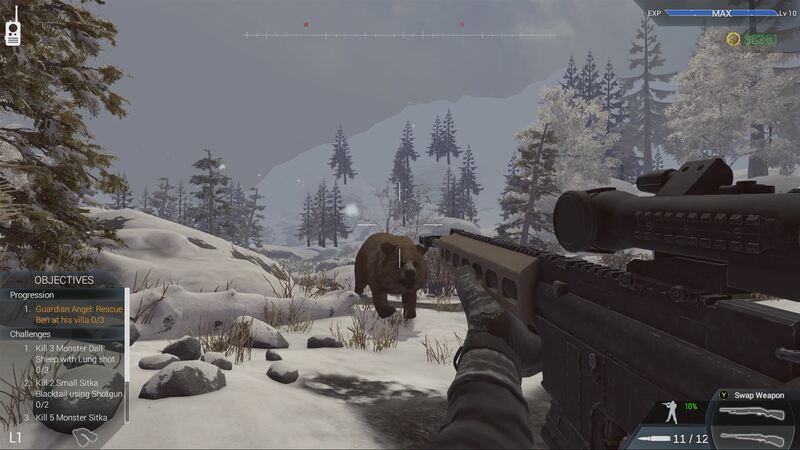 I know that it seems odd to compare it to two games from previous console generations, but if I compare it to theHunter: Call of the Wild, there would only be one thing I could say: theHunter is significantly better than Deer Hunter: Reloaded, in every way. The audio of the guns meanwhile is decent at best, it sounds more like the modern-day blockbuster form of a gun, where everything is short and compressed, when in reality a rifle is signified by a long retort. The animals don’t really make any noise, no calls of distress or regular noises that would give them life. Heck, the only way I knew I was being attacked by a predator was from my controller buzzing and pulsing faster and faster. As for the shooting, it just doesn’t feel good. You sway constantly, almost as if you’re on a boat during a massive storm, and you can only hold your breath for a second or two, which isn’t really long enough to line up a good shot on an animal’s heart, especially when they are moving. When you shoot, it never feels like you’ve shot an animal, even when you get a head shot and have a bullet cam, which seems greatly out of place. Any hunter that I’ve spoken to, which rivals over two dozen, has always told me that you aim for the heart, which is slightly to the right and down of a deer’s front legs, if you’re looking at it from the side view. You shoot there because you’ll kill the deer significantly quicker than anywhere else, and it’s easier to shoot than the head, what with their tendency to move their heads more than they move their hearts. Sometimes in this game, you don’t even kill a deer when you hit it in the heart, and it strikes me as odd that an animal wouldn’t die from you shooting them in what the game deems a vital shot. Overall, Deer Hunter: Reloaded isn’t worth the money, especially when you find out that this is made by GluGames, who made a mobile game by the same name as this. That one is free, and this one is £15.99. The Microsoft Store also lists that it has IAPs, which perplexes me. Unless it’s for boatloads of cash, this game doesn’t have anything that would allow for microtransactions. Simply put, it feels like a hunting game made by somebody who has never gone hunting. It’s a mobile game made for the latest consoles, and it’s going to leave you frustrated if you know anything about hunting. The shooting doesn’t feel nice, everything feels very lifeless and lacks any true depth of quality. 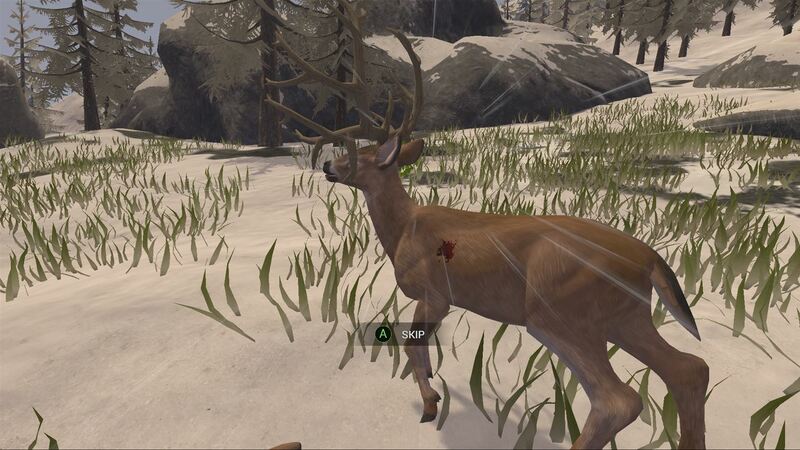 If you’re looking to spend money on a hunting game, you might want to drop some extra cash and get theHunter: Call of the Wild, which is superior in every way. This game, The Misnamed Hunter: Reloaded, is firing blanks in every category, and it’s no wonder why it doesn’t hit the mark of a hunting game – or even a good game for that matter.